A few weeks ago, we opened team registration for our 12th Counter-Strike: Global Offensive Season for teams of all skill levels in Europe and North America featuring more than $33,000 USD in cash prizes! Today we'd like to reward those of you that have completed the registration process and have taken advantage of our early bird discounts with the opportunity to win some FREE CS:GO SKINS in time for use in the upcoming season! If you haven't registered already, don't worry, there's still time! 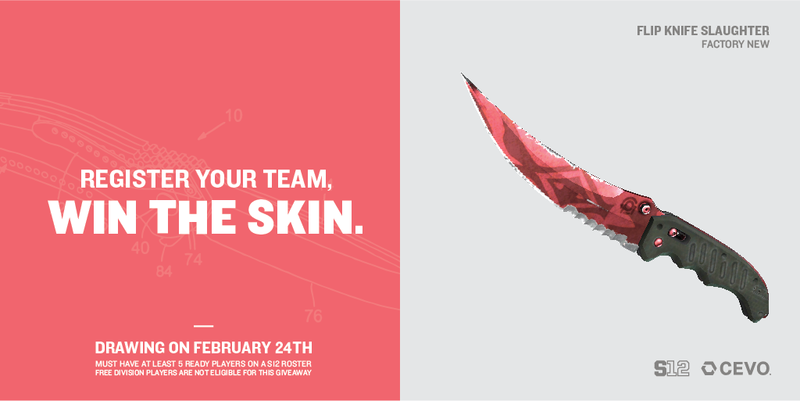 Save your money and pay your team's league fees before Thursday, February 23rd, 2017 to take advantage of these discounts and to become eligible for our early bird CS:GO skin giveaway below! Click HERE to register now for CEVO CS:GO Season 12!